The new Apple iPhone 4S has a decent speaker (considering the phone’s tiny size). 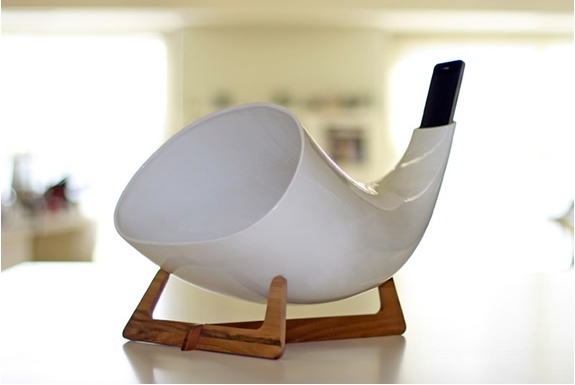 Here’s the cool and artistic way to get an iPhone to sound even better, or at least louder: Place the iPhone atop a MegaPhone. 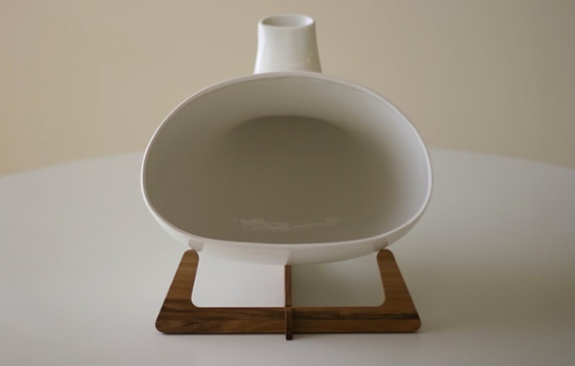 Designed by the boutique Italian shop en&is, the MegaPhone is a hand sculpted piece of ceramics that resembles a stubby version of a Swiss alpenhorn. No electronics, circuit boards or 30-pin connectors are involved. The passive acoustic properties of MegaPhone are all that amplify the sound. As such, it’d be great for camping or for places there’s no electricity. 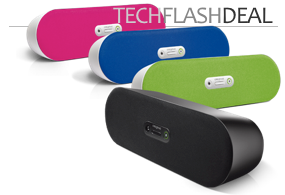 The MegaPhone will work with any model iPhone or iPod Touch or any smarphone that’s roughly iPhone-sized and has its speaker at its base. So how much louder is an iPhone when played through a MegaPhone? Substantially. If a stand-alone iPhone is loud enough to be heard 20 meters away, it will be loud enough to be heard across a football field (and then some) when played through a MegaPhone. Unfortunately, the price tag on a MegaPhone will blow you away too, and not in a good way. The white and black versions cost €400; the gold-platted model runs €600. What an amazing new speaker concept. This is PERFECT for camping! And at the beach, any place where you don’t want to have to use batteries for something. Very cool article and post.